I’m just going to come out and say it: this was not our most successful family holiday. But before I lead you to the wrong conclusion, I must quickly assert that it was not our choice of accommodation that was to blame. 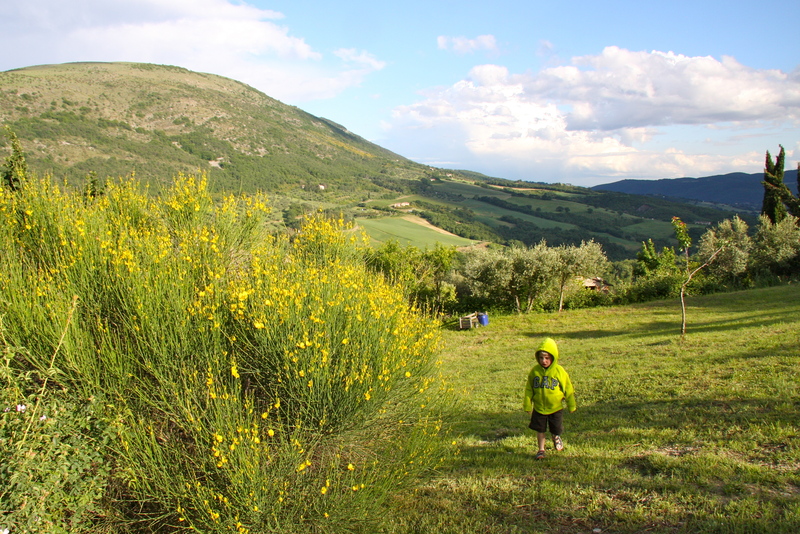 On the contrary, Alsagra, a farmhouse in the Umbrian hills, is lovely: a child-friendly haven which delivered on our expectations. No, we were struck by the Italian curse*: a severe case of ropey weather. Of our seven days, only one was totally dry. Temperatures struggled to get above 15 degrees. Our dreams of chianti and BBQs in the sunshine as our children frolicked in t-shirts and shorts were extinguished by the torrential downpours. Utterly unseasonal for the last week in May, even the Italians were despairing and had taken to consulting weather apps every day for signs of summer. With British resolve we donned our Gore-texes and got out and about, splashing in puddles and, when really desperate, seeking out soft play. We made the most of the few bouts of sunshine, rapidly donning our swimming trunks and wet-suits; but we could never really escape an overwhelming feeling of being a bit cold, and a bit damp. So, it is through a lens of meteorological disappointment and soggy towels that I try to provide you with an objective review. *The Italian curse may be unique to us. But a previous holiday to Puglia, also marred by glum weather, has led us to believe Italy may actually be an outpost of Wales in the otherwise scorching Mediterranean. Having already ‘done’ France and Spain with the children, we thought it was time to introduce them to Italy. Italians are besotted with children, so we knew they would be welcome everywhere (which they were). The kids devour Italian food (pasta and pesto being their favourite tea ever), so dining out would be a pleasure not a chore. We were not bothered about beaches (I wouldn’t choose Italy for those): we just wanted a week of pottering, playing and gelati-eating. I came across Alsagra on the Baby-friendly Boltholes (BFB) website. After my usual extensive research, it seemed to offer everything we were looking for – and even a little bit more. 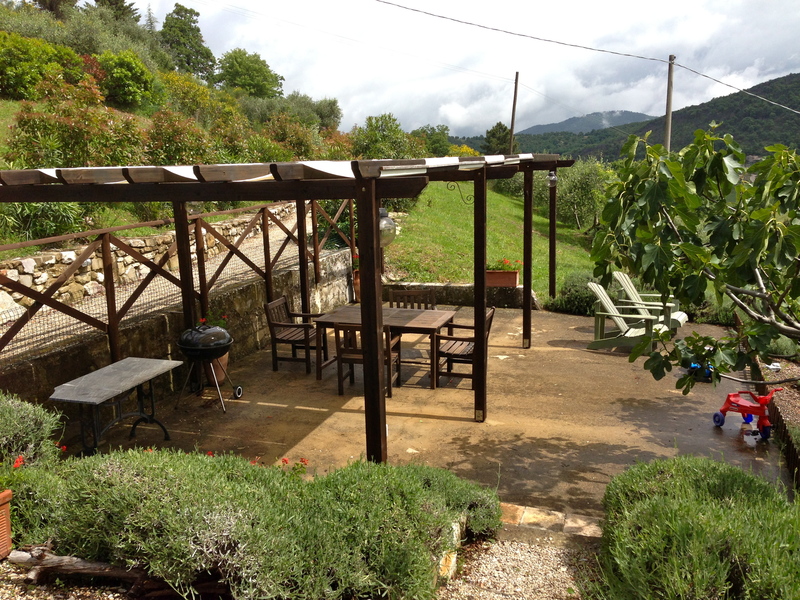 Its setting is stunning: overlooking the national park of Monte Tezio, the views are outstanding, with walks from the door along safe country roads. There are three two-bedroom apartments on site, giving the option for socialising with other parents (and your children making friends) – something we’d enjoyed at other similar BFBs. There were playgrounds, goats, and even a zip-wire for the kids. Plus Helen, the owner, offers babysitting should you wish to head out for dinner a deux. Perfect. – What really sets Alsagra apart is the ‘kids club’. 2 mornings a week, an English childminder will entertain the children giving you some precious time to yourselves – to have a coffee, sit and read or go for a walk. 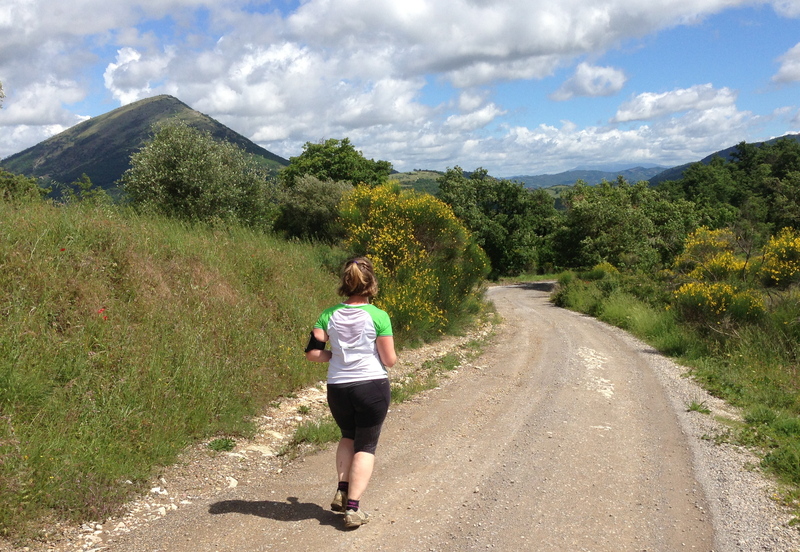 One morning we got out and hiked up Monte Tezio which offered stunning views – highly recommended. The other, we went for a run in a rare moment of sunshine. – Helen also offers a weekly pizza-making evening throughout the season – which sounds like a fun opportunity to socialise with other families. Unfortunately for us, the weather scuppered it – a shame as our improvised pizza night out in nearby Perugia instead ended up being quite stressful (think traffic jams and multi-storey car parks). – The playgrounds were a cut above the average. 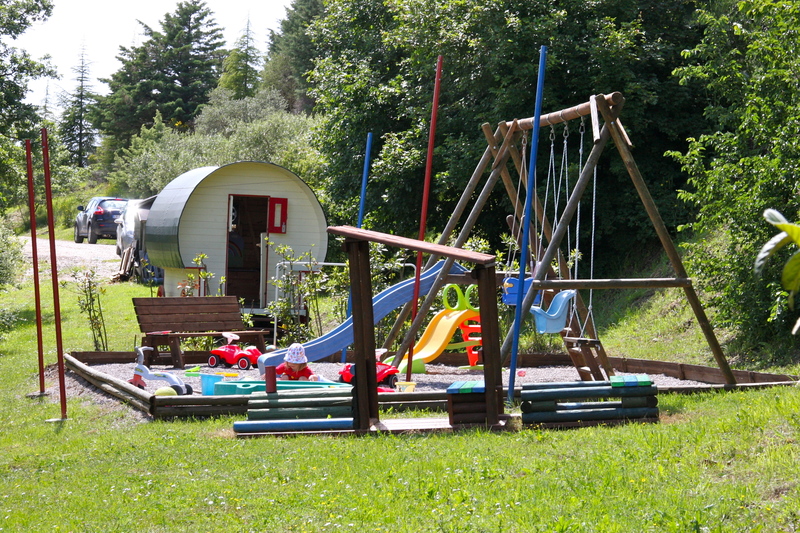 Alongside the usual slides and swings, there’s a gypsy caravan for kids to play in – totally cool and unique. There are dressing-up costumes, and the floor is made up of a road layout, which Leo loved. The cars that he brought with him lived in there all week. – Leo and Genevieve made good friends with the children in the apartment next door: they fed the goats together, played in the playgrounds and just generally hung out. They actively sought each other out each morning which was lovely to see and made for a convivial atmosphere. – The owners live on site and are around to deal with any problems or answer any questions. I like being ‘hosted’ in this way, the personal touch really makes a difference when you are travelling with kids and need more advice. – The location is somewhat isolated. You really do have to drive everywhere – the nearest shop (which, by the way, is amazing – it never seemed to close!) is five minutes away, down the hill and your 10-15 minutes from restaurants. I don’t think this would be a problem if the weather is good because you wouldn’t want to leave that much – Alsagra is the sort of place you’d be happy to potter about, between pool and playground and terrace. But when you’re back and forth several times a day actively ‘doing stuff’ to pass the time, it can get a little wearing. – There is no mid-week clean or change of linen. Not that you’d necessarily expect that with self-catering but we’ve really appreciated it at some other BFBs we’ve stayed at – especially if the weather is damp and there’s no way to dry your towels. – Don’t fly to Rome (Fiumicino). We had a terrible start to our holiday: first, it took an age for the aircraft to get on a gate; then it was impossible to find a luggage trolley (and when we did, it required a 1 euro coin, which of course I didn’t have); and finally – the horror – a two hour wait at Avis to pick up the hire car. In total, it took 3 hours to get out of the airport. The only positive was a soft play area near the luggage carousels – but even that caused tears when we had to drag the kids out of it. Sigh. – It’s a long drive from the major airports (Rome, Bologna, Pisa) to Alsagra. Ryanair do fly from Stansted to Perugia, which would be perfect, just 20-30 minutes away, plus nice and small. However, Alsagra rentals in peak season are Saturday-to-Saturday and, in May at least, Ryanair only flew in on a Tuesday, ruling them out. When you’ve had a bad experience at the airport or a flight delay, with over-tired kids in tow, then the long drive may just overwhelm. 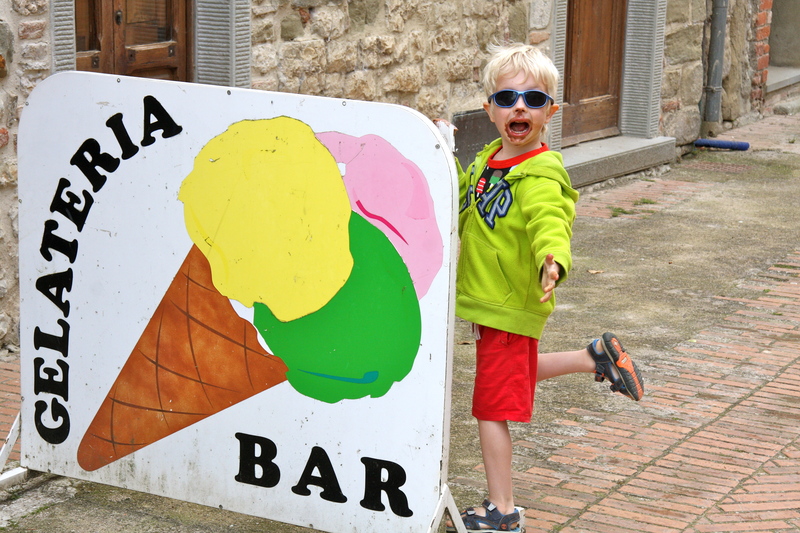 – There is an excellent soft play area at Assisi – I think it’s the best we’ve ever been to. 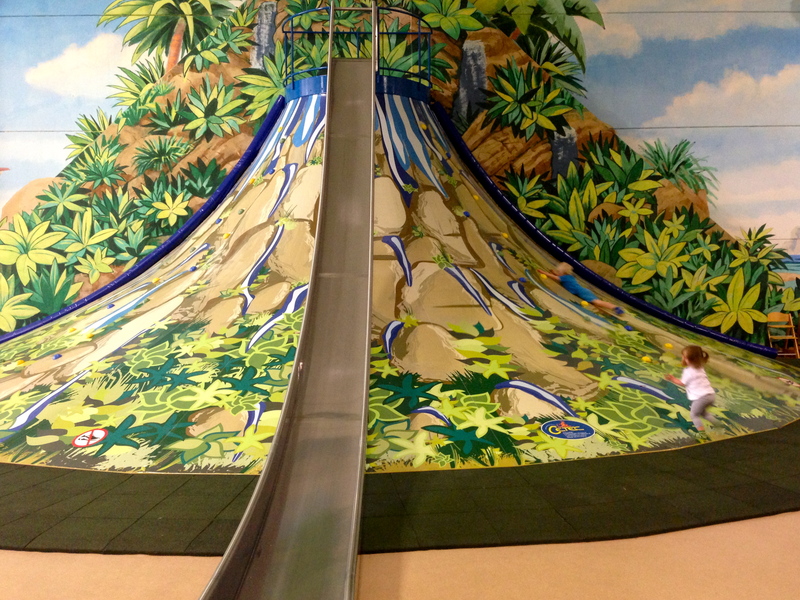 The star attraction was a ‘volcano slide’, which you try and run to the top of. The whole family was charging up and sliding down with glee. Bear in mind that this is Italy and it doesn’t actually open till 3pm (and stays open till 9pm!). We were there bang on doors opening and had the place to ourselves. – Whilst this is not a beach destination, Alsagra is just 20 minutes from Lake Trasimeno, which gives you the option of a day by the water. 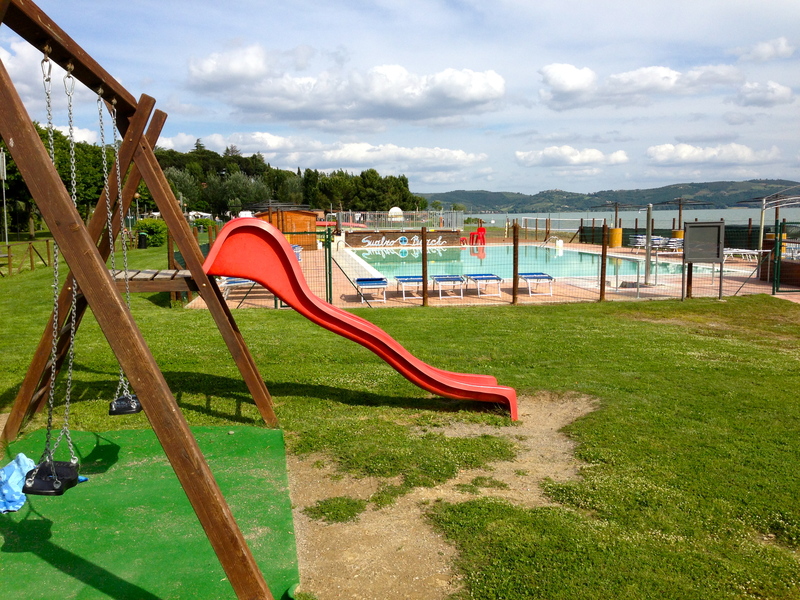 There are lake beaches which kids will love – on our one dry day, we went to Sualzo, in Passignano. Like most Italian beaches, it is very organised, with a cafe, showers, toilets, loungers, playground and swimming pool (closed when we were there) – making it easy with kids. There’s free parking too. 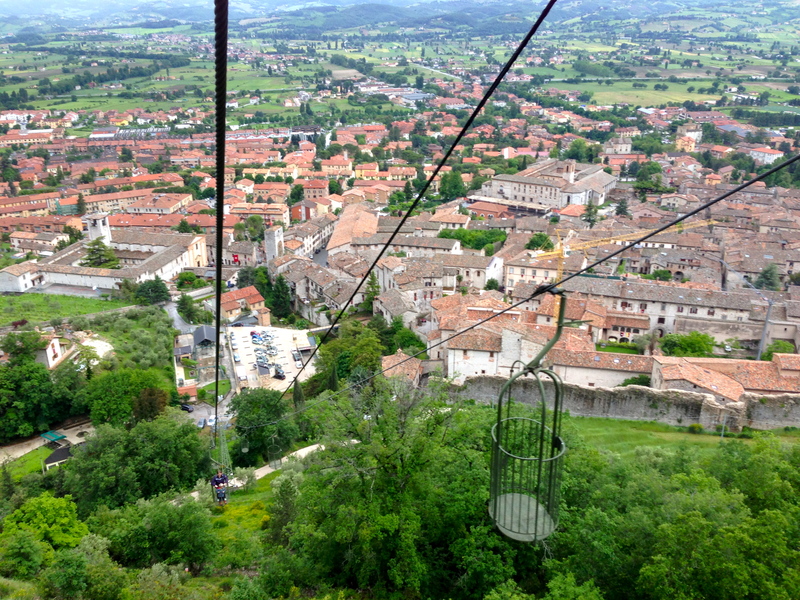 – Kids have limited interest in walking around beautiful Italian hill towns but one worth a visit is Gubbio. About 40 minutes drive away, its pièce de resistance, as far as kids are concerned, is the ‘cable car’. Comprising unusual stand-up cages, your on-boarding involves taking a running jump. Getting-off requires a leap of faith. The views on the way up and down are stunning, even in the mist. Both Leo and Genevieve loved it. – If like us, you get rain, then a good place to head is the Perugina chocolate factory in nearby Perugia. We didn’t time it quite right, so we missed the tour of the factory floor itself, which was a shame. We had a quick look round the museum but the main event for the kids was the shop, complete with a glass floor filled with sweets. Of course, we didn’t leave without two bags of ‘Baci’ (delicious chocolate tears filled with praline and a whole hazlenut), complete with Baci-branded taxi fridge-magnets. What else?! If you are smitten with Italy and want a week away from the hustle and bustle, I wouldn’t hesitate in recommending Alsagra. It has all the elements for lovely family holidays, plus some extra sparkles – it’s rare to find a kids club in this sort of set up. Despite the weather, we had a good time – it’s just not what we were imagining. We had to change modes from ‘Mediterranean holiday’ to ‘Summer in Cornwall’. Having fun just meant being more organised – we had to have a plan each day, else face hours in our apartment watching DVDs. There was just about enough do to in the area, but I think I would have struggled to fill a second week of dodgy weather without involving a lot more driving (and spending a lot more). Two weeks of rain, however, would be highly unlucky – a true case of the ‘Italian curse’. This entry was posted in Accommodation reviews, Europe and tagged Alsagra, Alsagra reviews, Umbria family accommodation, Umbria family holidays, Umbria with kids. Bookmark the permalink.